Certain terms or phrases occur with regularity in egg recipes, here are many of them along with an explanation. Baked custard mixtures are done when a metal knife inserted off center comes out clean. The very center still may not be quite done, but the heat retained in the mixture will continue to cook it after removal from the oven. Cooking longer may result in a curdled and/or weeping custard. Cooking a shorter period may result in a thickened but not set custard. For stirred custard mixtures, the eggs are cooked to the proper doneness when a thin film adheres to a metal spoon dipped into the custard. This point of coating a metal spoon is 20 to 30 degrees below boiling. Stirred custards should not boil. The finished product should be soft and thickened but not set. Stirred custards will thicken slightly after refrigeration. Use a fork or whisk to beat eggs just until the yolks and whites are blended. Use a mixer, blender, beater or whisk to beat eggs until they are light, frothy and evenly colored. Beat yolks at high speed with an electric mixer until they become a pastel yellow and form ribbons when the beater is lifted or they are dropped from a spoon, about 3 to 5 minutes. Although yolks can’t incorporate as much air as whites, this beating does create a foam and is important to airy concoctions such as sponge cakes. When eggs or egg yolks are added to a hot mixture all at once, they may begin to coagulate too rapidly and form lumps. So, stir a small amount of the hot mixture into the yolks to warm them and then stir the warmed egg yolk mixture into the remaining hot mixture. This is called tempering. Some recipes call for eggs to be at room temperature before eggs are to be combined with a fat and sugar. Cold eggs could harden the fat in such a recipe and the batter might become curdled. This could affect the texture of the finished product. Remove eggs from the refrigerator about 30 minutes before using them or put them in a bowl of warm water while assembling other ingredients. For all other recipes, however, use eggs straight from the refrigerator. Fat inhibits the foaming of egg whites. Since egg yolks contain fat, they are often separated from the whites and the whites beaten separately to allow them to reach their fullest possible volume. Eggs are easiest to separate when cold, but whites reach their fullest volume if allowed to stand at room temperature for about 30 minutes before beating. Many inexpensive egg separators are available. To separate, tap the midpoint of the egg sharply against a hard surface. Holding the egg over the bowl in which you want the whites, pull the halves apart gently. Let the yolk nestle into the cup like center of the separator and the white will drop through the slots into the bowl beneath. Drop 1 egg white at a time into a cup or small bowl and then transfer it to the mixing bowl before separating another egg. This avoids the possibility of yolk from the last egg getting into several whites. Drop the yolk into another mixing bowl if needed in the recipe or into a storage container if not. Egg whites beat to greater volume than most other foods including whipping cream, but the air beaten into them can be lost quite easily. A stabilizing agent such as cream of tartar is added to the whites to make the foam more stable. Lemon juice works much the same way. When making meringues and some cakes, sugar is slowly added to beaten egg whites. This serves to increase the stability of the foam. Sugar, however, can retard the foaming of the whites and must be added slowly so as not to decrease the volume. Beat the whites until foamy, then slowly beat in the sugar. Beat whites with a mixer, beater or whisk just until they no longer slip when the bowl is tilted. (A blender or food processor will not aerate them properly.) If egg whites are under beaten, the finished product may be heavier and less puffy than desired. If egg whites are over beaten, they may form clumps which are difficult to blend into other foods in the mixture and the finished product may lack volume. Whites that have been beaten until high in volume but not beaten to the stiff peak stage. When beater is lifted, peaks will form and curl over slightly. When combining beaten egg whites with other heavier mixtures, handle carefully so that the air beaten into the whites is not lost. It’s best to pour the heavier mixture onto the beaten egg whites. Then gradually combine the ingredients with a downward stroke into the bowl, across, up and over the mixture motion, using a spoon or rubber spatula. Come up through the center of the mixture about every three strokes and rotate the bowl as you are folding. Fold just until there are no streaks remaining in the mixture. Don’t stir because this will force air out of the egg whites. If you have a stand mixer, put the mixing bowl on the turntable for easier turning as you fold. Also known as syneresis or weeping. When egg mixtures such as custards or sauces are cooked too rapidly, the protein becomes overcoagulated and separates from the liquid leaving a mixture resembling fine curds and whey. If curdling has not progressed too far, it may sometimes be reversed by removing the mixture from the heat and stirring or beating vigorously. Egg cartons from USDA-inspected plants must display a Julian date – the date the eggs were packed. Although not required, they may also carry an expiration date beyond which the eggs should not be sold. In USDA-inspected plants, this date cannot exceed 30 days after the pack date. It may be less through choice of the packer or quantity purchaser such as your local supermarket chain. Plants not under USDA inspection are governed by laws of their states. Starting with January 1 as number 1 and ending with December 31 as 365, these numbers represent the consecutive days of the year. This numbering system is sometimes used on egg cartons to denote the day the eggs are packed. Fresh shell eggs can be stored in their cartons in the refrigerator for 4 to 5 weeks beyond this date with insignificant quality loss. Shell: The color comes from pigments in the outer layer of the shell and may range in various breeds from white to deep brown. The breed of hen determines the color of the shell. Breeds with white feathers and ear lobes lay white eggs; breeds with red feathers and ear lobes lay brown eggs. White eggs are most in demand among American buyers. In some parts of the country, however, particularly in New England, brown shells are preferred. The Rhode Island Red, New Hampshire and Plymouth Rock are breeds that lay brown eggs. Since brown-egg layers are slightly larger birds and require more food, brown eggs are usually more expensive than white. White: Egg albumen in raw eggs is opalescent and does not appear white until it is beaten or cooked. A yellow or greenish cast in raw white may the presence of riboflavin. Cloudiness of the raw white is due to the presence of carbon dioxide which has not indicated time to escape through the shell and thus indicates a very fresh egg. On very rare occasions, a hard-cooked egg white may darken to a caramel shade due to a high amount of iron in the cooking water or to a carbonylamine-type reaction. Using fresh eggs and cooling them quickly after cooking helps to prevent this darkening. Yolk color depends on the diet of the hen. If she gets plenty of yellow-orange plant pigments known as xanthophylls, they will be deposited in the yolk. Hens fed mashes containing yellow corn and alfalfa meal lay eggs with medium yellow yolks, while those eating wheat or barley yield lighter-colored yolks. A colorless diet, such as white cornmeal produces almost colorless yolks. 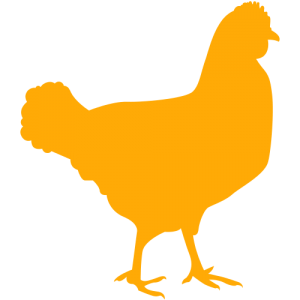 Natural yellow-orange substances such as marigold petals may be added to light-colored feeds to enhance yolk color. Artificial color additives are not permitted. Gold or lemon-colored yolks are preferred by most buyers in this country. Yolk pigments are relatively stable and are not lost or changed in cooking. Sometimes there is a greenish ring around hard-cooked egg yolks. It is the result of sulfur and iron compounds in the egg reacting at the surface of the yolk. It may occur when eggs are overcooked or when there is a high amount of iron in the cooking water. Although the color may be a bit unappealing, the eggs are still wholesome and nutritious and their flavor is unaffected. Greenish yolks can best be avoided by using the proper cooking time and temperature and by rapidly cooling the cooked eggs. Occasionally several concentric green rings may be seen in hard-cooked egg yolks. A yolk develops within the hen in rings. Iron in the hen’s feed or water as the rings are formed may cause this coloring. Sometimes a large batch of scrambled eggs may turn green. Although not pretty, the color change is harmless. It is due to a chemical change brought on by heat and occurs when eggs are cooked at too high a temperature, held for too long or both. Using stainless steel equipment and low cooking temperature, cooking in small batches and serving as soon as possible after cooking will help to prevent this. If it is necessary to hold scrambled eggs for a short time before serving, it helps to avoid direct heat. Place a pan of hot water between the pan of eggs and the heat source. The empty space between the white and shell at the large end of the egg. When an egg is first laid, it is warm. As it cools, the contents contract and the inner shell membrane separates from the outer shell membrane to form the air cell. The candler uses the size of the air cell as one basis for determining grade. In Grade AA eggs, the air cell may not exceed 1/8-inch in depth and is about the size of a dime. The air cell of Grade A eggs may exceed 3/16-inch in depth. For Grade B eggs, there is no limit on air cell size. As the egg ages, moisture and carbon dioxide leave through the pores of the shell, air enters to replace them and the air cell becomes larger. You can see the air cell in the flattened end of a peeled, hard-cooked egg. Also known as egg white. Albumen accounts for most of an egg’s liquid weight, about 67%. It contains more than half the egg’s total protein, niacin, riboflavin, chlorine, magnesium, potassium, sodium and sulfur. The albumen consists of 4 alternating layers of thick and thin consistencies. From the yolk outward, they are designated as the inner thick or chalaziferous white, the inner thin white, the outer thick white and the outer thin white. Egg white tends to thin out as an egg ages because its protein changes in character. That’s why fresh eggs sit up tall and firm in the pan while older ones tend to spread out. Albumen is more opalescent than truly white. The cloudy appearance comes from carbon dioxide. As the egg ages, carbon dioxide escapes, so the albumen of older eggs is more transparent than that of fresher eggs. When egg albumen is beaten vigorously, it foams and increases in volume 6 to 8 times. Egg foams are essential for making souffles, meringues, puffy omelets, and angel food and sponge cakes. Also called meat spots. Occasionally found on an egg yolk. Contrary to popular opinion, these tiny spots do not indicate a fertilized egg. Rather, they are caused by the rupture of a blood vessel on the yolk surface during formation of the egg or by a similar accident in the wall of the oviduct. Less than 1% of all eggs produced have blood spots. Ropey strands of egg white which anchor the yolk in place in the center of the thick white. They are neither imperfections nor beginning embryos. The more prominent the chalazae, the fresher the egg. Chalazae do not interfere with the cooking or beating of the white and need not be removed, although some cooks like to strain them from stirred custard. The entrance of the latebra, the channel leading to the center of the yolk. The germinal disc is barely noticeable as a slight depression on the surface of the yolk. When the egg is fertilized, sperm enter by way of the germinal disc, travel to the center and a chick embryo starts to form. Shell Membranes Just inside the shell are two shell membranes, inner and outer. After the egg is laid and it begins to cool, an air cell forms between these two layers at the large end of the egg. Vitelline Membrane: This is the covering of the yolk. Its strength protects the yolk from breaking. The vitelline membrane is weakest at the germinal disc and tends to become more fragile as the egg ages. The egg’s outer covering, accounting for about 9 to l2% of its total weight depending on egg size. The shell is the egg’s first line of defense against bacterial contamination. The shell is largely composed of calcium carbonate (about 94%) with small amounts of magnesium carbonate, calcium phosphate and other organic matter including protein. Shell strength is greatly influenced by the minerals and vitamins in the hen’s diet, particularly calcium, phosphorus, manganese and Vitamin D. If the diet is deficient in calcium, for instance, the hen will produce a thin or soft-shelled egg or possibly an egg with no shell at all. Occasionally an egg may be prematurely expelled from the uterus due to injury or excitement. In this case, the shell has not had time to be completely formed. Shell thickness is also related to egg size which, in turn, is related to the hen’s age. As the hen ages, egg size increases. The same amount of shell material which covers a smaller egg must be “stretched” to cover a larger one, hence the shell is thinner. Seven to 17 thousand tiny pores are distributed over the shell surface, a greater number at the large end. As the egg ages, these tiny holes permit moisture and carbon dioxide to move out and air to move in to form the air cell. The shell is covered with a protective coating called the cuticle or bloom. By blocking the pores, the cuticle helps to preserve freshness and prevent microbial contamination of the contents. Uses for eggshells vary from the thrifty (compost) to the creative (decorating). The yolk or yellow portion makes up about 33% of the liquid weight of the egg. It contains all of the fat in the egg and a little less than half of the protein. With the exception of riboflavin and niacin, the yolk contains a higher proportion of the egg’s vitamins than the white. All of the egg’s vitamins A, D and E are in the yolk. Egg yolks are one of the few foods naturally containing vitamin D.
The yolk also contains more phosphorus, manganese, iron, iodine, copper, and calcium than the white, and it contains all of the zinc. The yolk of a Large egg contains about 59 calories. Double-yolked eggs are often produced by young hens whose egg production cycles are not yet completely synchronized. They’re often produced, too, by hens who are old enough to produce Extra Large eggs. Genetics is a factor, also. Occasionally a hen will produce double-yolked eggs throughout her egg-laying career. It is rare, but not unusual, for a young hen to produce an egg with no yolk at all. In fertilized eggs, the yolk is the site of embryo formation. It is the yolk which is responsible for the egg’s emulsifying properties. Eggs which can be incubated and developed into chicks. Fertile eggs are not more nutritious than nonfertile eggs, do not keep as well as nonfertile eggs and are more expensive to produce. Fertile eggs may contain a small amount of male hormone, but there are no known advantages. True free-range eggs are those produced by hens raised outdoors or that have daily access to the outdoors. Due to seasonal conditions, however, few hens are actually raised outdoors. Some egg farms are indoor floor operations and these are sometimes erroneously referred to as free-range operations. Due to higher production costs and lower volume per farm, free-range eggs are generally more expensive. The nutrient content of eggs is not affected by whether hens are raised free-range or in floor or cage operations. How recently an egg was laid has a bearing on its freshness but is only one of many factors. The temperature at which it is held, the humidity and the handling all play their part. These variables are so important that an egg one week old, held under ideal conditions, can be fresher than an egg left at room temperature for one day. The ideal conditions are temperatures that don’t go above 40°F. (4°C.) and a relative humidity of 70 to 80%. Proper handling means prompt gathering, washing and oiling of the eggs within a few hours after laying. Most commercially produced eggs reach supermarkets within a few days of leaving the laying house. If the market and the buyer handle them properly, they will still be fresh when they reach the table. It is not true that freshness can be judged by placing an egg in salt water. A carefully controlled brine test is sometimes used to judge shell thickness of eggs for hatching purposes but has no application to freshness of table eggs. How important is “freshness”? As an egg ages, the white becomes thinner and the yolk becomes flatter. These changes do not have any great effect on the nutritional quality of the egg or its functional cooking properties in recipes. Appearance may be affected, though. When poached or fried, the fresher the egg, the more it will hold its shape rather than spread out in the pan. On the other hand, if you hard cook eggs that are at least a week old, you’ll find them easier to peel after cooking and cooling than fresher eggs. Classification determined by interior and exterior quality and designated by letters — AA, A and B. In many egg packing plants, the USDA provides a grading service for shell eggs. Its official grade shield certifies that the eggs have been graded under federal supervision according to USDA standards and regulations. The grading service is not mandatory. Other eggs are packed under state regulations which must meet or exceed federal standards. In the grading process, eggs are examined for both interior and exterior quality and are sorted according to weight (size). Grade quality and size are not related to one another. In descending order of quality, grades are AA, A and B. There is no difference in nutritive value between the different grades. Because production and marketing methods have become very efficient, eggs move so rapidly from laying house to market that you will find very little difference in quality between Grades AA and A. Although grade B eggs are just as wholesome to eat, they rate lower in appearance when broken out. Almost no Grade B’s find their way to the retail supermarket. Some go to institutional egg users such as bakeries or foodservice operations, but most go to egg breakers for use in egg products. A ‘Grade AA’ egg will stand up tall. The yolk is firm and the area covered by the white is small. There is a large proportion of thick white to thin white. A ‘Grade A’ egg covers a relatively small area. The yolk is round and upstanding. The thick white is large in proportion to the thin white and stands fairly well around the yolk. A ‘Grade B’ egg spreads out more. The yolk is flattened and there is about as much (or more) thin white as thick white. Eggs from hens fed rations having ingredients that were grown without pesticides, fungicides, herbicides or commercial fertilizers. No commercial laying hen rations ever contain hormones. Due to higher production costs and lower volume per farm, organic eggs are more expensive than eggs from hens fed conventional feed. The nutrient content of eggs is not affected by whether or not the ration is organic. Several factors influence the size of an egg. The major factor is the age of the hen. As the hen ages, her eggs increase in size. The breed of hen from which the egg comes is a second factor. Weight of the bird is another. Pullets significantly underweight at sexual maturity will produce small eggs. Environmental factors that lower egg weights are heat, stress, overcrowding and poor nutrition. All of these variables are of great importance to the egg producer. Even a slight shift in egg weight influences size classification and size is one of the factors considered when eggs are priced. Careful flock management benefits both the hens and the producer. Egg sizes are Jumbo, Extra Large, Large, Medium, Small and Peewee. Medium, Large and Extra Large are the sizes most commonly available. Sizes are classified according to minimum net weight expressed in ounces per dozen. Although any size egg may be used for frying, scrambling, cooking in the shell or poaching, most recipes for baked dishes such as custards and cakes are based on the use of Large eggs. To substitute another size, use the following chart.